SILVER and GOLD PRICES stalled today. Silver shaved off 5.3¢ to $14.276 on Comex. The GOLD PRICE scraped off 60¢ to end at $1,127.30. No market is infinitely flexible. Can’t put off a decision forever. 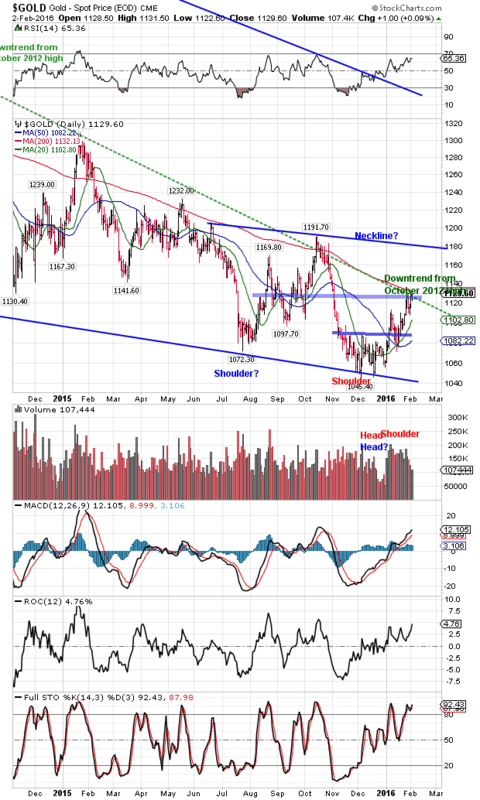 Therefore silver and gold prices must move decisively. Yes, they’be been trending up since the December low, but now they have come to “Fish or cut bait” time. Sitting slap against the downtrend line from the October 2012 high, slap up against the 200 day moving average ($1,132), the gold price can’t just wilt again. It must clear those points, then climb smartly higher to convince buyers it has some prospect. After 4-1/2 years waiting, investors need persuasion. In January 2015 the GOLD PRICE rallied nearly to that downtrend line, even crossed above its 200 DMA, but failed. In May it reached again toward the line, peeked through the 200 DMA, but fell back. In October it pierced both barriers, only to fizzle out and waterfall to new lows. Understand, when I say gold must fish or cut bait, I’m not just flapping my gums. As in life, if you’re not moving forward you’re falling back — soon. SILVERS story is similar. It has formed a bowl since November, and a bowl usually resolves by breaking upward. Lip of the bowl lies about $14.40 – $14.65. Call it $14.65 to get plumb clear. Silver tried in December, and failed. Tried again in December, and failed, and has failed twice in January. Keep failing, and the bowl turns into the type that flushes. 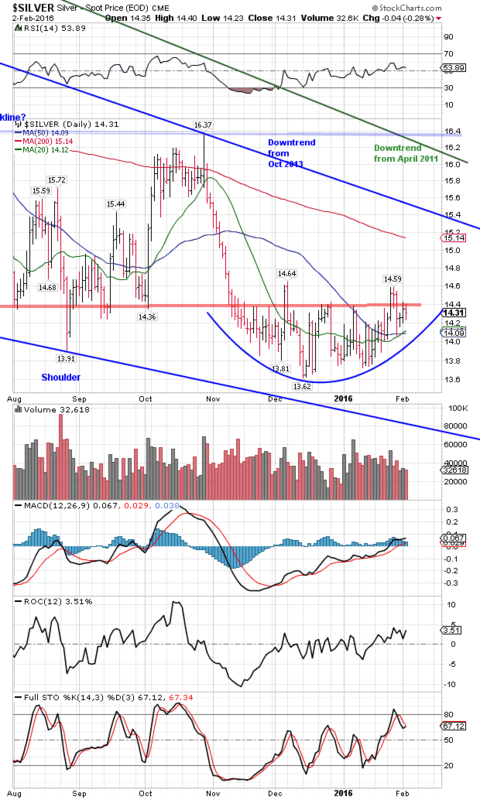 I think silver and gold are trying to rally, but no breakout, no rally. Stocks lost big today. Dow tumbled 295.64 (1.8%) to 16,153.54. S&P500 lapsed 36.35 to 1,903.03, down 1.87%. Both closed BELOW their 20 day moving averages, so short term momentum is down although some indicators still point up. Greater volatility points out lower strength. Right now they need lows below 15,450 and 1,812 to turn them down. Probably will work higher so the bear can lure more incautious bovines into his lair, where he can maul them at will. US dollar index is working hard to appear weak. Today again it tried to break down out of that wedge (or channel) formation earthward. closed below 20 and on the 50 day moving averages, down 16 basis points at 98.86. Where is the strength by which it vaulted on Friday? Vanished. Gone. If the dollar index breaks that 50 DMA (98.85) and that pattern’s bottom boundary, there will be nothing to hold it up but Nice Government Men, and I hope they ain’t the skinny, wormy ones. Many thanks for your prayers for Susan’s eye surgery last Tuesday. It was successful but more painful in recovery than we anticipated. Today it’s improving, but still painful. Please remember her in your prayers.